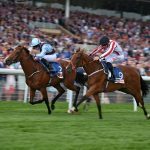 Eighteen of the top 100 horses in this year’s Melbourne Cup weights carry a British suffix, while a further 40 were foaled in either Ireland, France or Germany, meaning that European-bred horses account for 58% of that number. Only 24 can line up for the great race on the first Tuesday of November but it’s reasonable to assume that horses from this part of the world will again play a dominant role. Britain may be famed for its stayers but breeders in this country have had a good run in top-class sprints this year. Most recently, Havana Grey, bred by Lady Caroline Lonsdale and Richard Kent, took the first running of the newly upgraded Flying Five on Irish Champions Weekend to become the first Group 1 winner for Tweenhills Farm & Stud’s Havana Gold, winner of last year’s TBA award for leading British-based first-season sire. Marie Matthews has achieved yet more notable success via her 18-year-old broodmare Easy To Imagine, whose 2010 mating in the first season Captain Gerrard stood at Mickley Stud for £3,500 produced Coolmore Nunthorpe Stakes winner Alpha Delphini. He followed his older half-brother Tangerine Trees into the history books as a Group 1 winner and further embellished the remarkable achievements of his dam, who was selected by Matthews for just 5,200gns. Also flying the flag for British sprint breeding this season is The Tin Man, now six and the winner of three Group 1 races. His recent win in the 32Red Sprint Cup came at his third attempt in Haydock’s premier contest, and he has now filled all three places in the last three years. Bred by Elizabeth Grundy, he is out of the Bishop Of Cashel mare Persario, who has given her connections plenty of fun over the years. The 19-year-old is also the dam of Deacon Blues, who, like The Tin Man, won the big sprint on QIPCO British Champions Day but before it was elevated to Group 1 status. Let’s hope that The Tin Man returns to Ascot to reclaim his title this year, and it is also fervently hoped that the horse who has in many ways stolen the season, Roaring Lion, lines up for his owner Qatar Racing on their biggest sponsorship day of the year. Roaring Lion and Saxon Warrior, now sadly retired, have provided some of the most thrilling clashes of the season. The pair have met five times this year, and six in total, with the widest margin separating them being the two and a half lengths by which Saxon Warrior beat Roaring Lion into fifth in the QIPCO 2,000 Guineas. While that was the pinnacle of the former’s career, Roaring Lion has done nothing but progress in admirable fashion since then and with three consecutive Group 1 wins under his belt and counting, he must surely be a contender for Horse of the Year honours. With yearling sales now in full swing and the racing season edging into dusk, announcements of stallion retirements will start to come thick and fast. Roaring Lion will make a stellar recruit to the Tweenhills ranks in time, but a personal hope is that we have the chance to see the grey son of Kitten’s Joy race for one more season. Shortly after this issue went to press, the TBA released the findings of its latest Economic Impact Study. We’ll bring you a full report of this in our November issue, by which time we’ll have further evidence of how well — or not — this season’s yearling sales are going. As Nancy Sexton outlines in her round-up from Books 1 and 2 of the mammoth Keeneland September Sale, which was still ongoing as we completed this month’s magazine, the North American market, at the top end at least, has returned to the extraordinary levels of trade last seen before the global recession. It’s fair to expect Book 1 at Tattersalls’ October Sale to remain largely untouched by the travails of other sections of the industry, but with political uncertainty in Europe surrounding Brexit, contrasting with an economic boom in America, it would be a surprise if Newmarket witnesses trade of US proportions. Sheikh Mohammed and Sheikh Hamdan were major players at Keeneland and, on the back of a return to the glory days for Godolphin this season, it’s fair to expect to see Sheikh Mohammed in particular continuing to play a significant role, particularly when the most talked-about horse in Book 1, a brother to Too Darn Hot and Lah Ti Dar, happens to be by Dubawi. Many people will likely feel a twinge of sadness that after this season we will no longer see the name Catridge Farm Stud on the list of consignors. 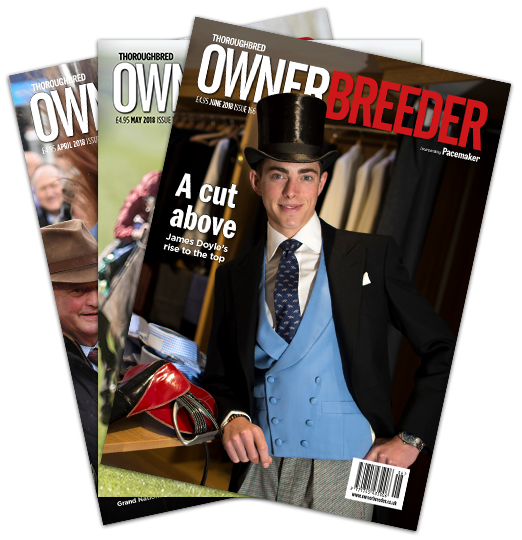 The Wiltshire farm’s co-owner David Powell has been a stalwart of the British breeding industry for many years and is as well liked as he is respected. He will remain involved as a breeder and pinhooker after the stud is sold and we look forward to seeing his friendly face among us at the sales for many years to come.